£20, with a 15% voucher and 15% off via S&S equals a low price of £14 for 100 capsules or 14p per capsule. You need 5 items a month to get the 15% S&S saving in addition to the 15% voucher. Colombia, Profondo, Ristretto, Splendente, and Ristretto decaf versions available at this price. Onyx and Forza are dearer at £23.90, but also have the 15% voucher available. 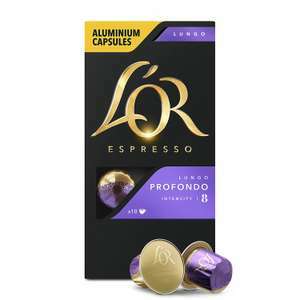 Thanks OP - have been looking for some reasonably priced Nespresso capsules. it says "15% extra saving on the FIRST Subscribe & Save delivery" - so remember to review the price again after your first order has been sent as you won't get the 15% voucher of subsequent price and the S+S prices do vary from month to month, so what was a deal initially, may not always be .